Can nonbiological brains have real minds of their own? In this article, drawn from his latest book, futurist/inventor Ray Kurzweil describes the future of intelligence — artificial and otherwise. thinking, of understanding a structure composed of diverse elements arranged in a pattern, representing that arrangement with a symbol, and then using that symbol as an element in a yet more elaborate configuration. This capability takes place.... Download PDF (610KB) Courtesy of the World Future Society, www.wfs.org. 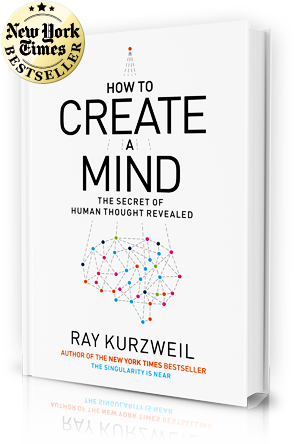 Ray Kurzweil’s "How to Create a Mind" examines how the brain's organizational capabilities drive how we live, learn and experience the world. Among the stranger things Ray Kurzweil will say to your face is that he intends to bring his father back to life. The famed inventor has a storage locker full of memorabilia—family photographs, letters, even utility bills—tied to his father, Fredric, who died in 1970. Someday, Kurzweil hopes to feed this data trove into a computer that will reconstruct a virtual rendering of dear old Dad. "There is a lot of suffering in the world," Kurzweil once explained. "Some of it can be overcome if we have the right solutions." Will the Willy Wonka of technology will help Google usher in a sci-fi future? Google has hired famed inventor and futurist Ray Kurzweil as director of engineering. Will he be a figurehead, or a driving force at the company? I was clutching at the face of a rock but it would not hold. Gravel gave way. I grasped for a shrub, but it pulled loose, and in cold terror I fell into the abyss. Note: Michael Shermer joins the discussion as well. Sometimes, when you work in this business long enough, you get to do some cool things. For me, one of those days came yesterday, when I sat between Ray Kurzweil and Juan Enriquez and took a wild stab at trying to moderate a discussion between them. Think how far and how fast technology has advanced. Just a century and a half ago, the fastest way we could communicate with each other was by Pony Express. Then came the telegraph, telephones and computers, all revolutionizing the way we live, work and play – in just a few decades. He is a pioneer, exploring a hinterland that lies just beyond the horizon of current possibilities; a twilight zone between science fact and fiction, between predictions rooted in existing technology and the wildest lunatic speculation. Inventor, futurist and author Ray Kurzweil has long predicted humans will one day be able to transcend the limitations of their biology. 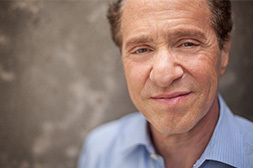 In a new book, Kurzweil explains why that day is coming sooner than we might think. He argues that the expansion of the brain's neocortex was the last biological evolution man needed to make. That's because it is inevitably leading to "truly intelligent machines," which Kurzweil calls the last invention that humanity needs to make. Join Diane and Ray Kurzweil for a discussion on prospects for attaining immortality through technology... more here. In the compelling introduction, we are told the story of evolution in a most entertaining fashion: that the world is based on information. Physics evolved and became chemistry, chemistry evolved into biology, biology to neurology. "(B)rains were now the cutting edge of storing and manipulating information. Thus we went from atoms to molecules to DNA to brains. The next step was uniquely human." USA TODAY Best-Selling Books, "How to Create a Mind"
The Mayans might have predicted that the end of the world is only a month away from now, but Ray Kurzweil would say the end of the world as we know it will come sometime in the middle of 2040. MARANA, Ariz.--Inventor, author, and futurist Ray Kurzweil took to the stage here at the Techonomy conference in Tucson to offer his thoughts on a future where humanity is enhanced by technology. Will we ever understand how our brains work? A pioneering developer of optical character recognition and text-to-speech software explores the possibility of creating a synthetic neocortex that could surpass the human mind.